Do you know someone that loves superheroes? 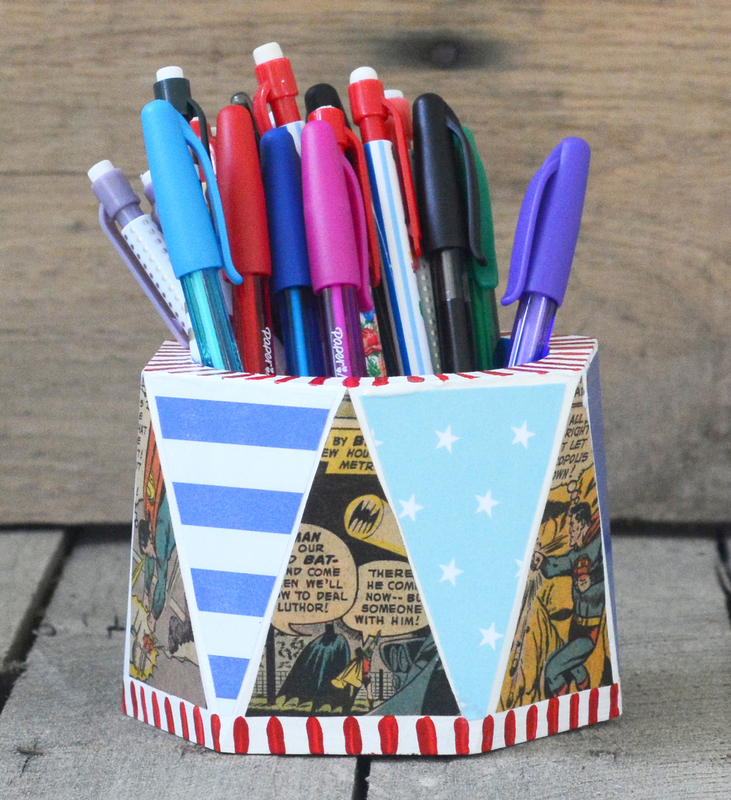 This pencil cup covered in comic books makes the perfect gift! Dad will love it . . . also great for Father's Day. Hi guys! 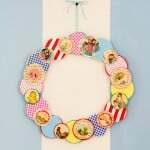 It's Ashlee from My So Called Crafty Life, and today I am back to share a fun project you can help the kiddos make for dad this Father's Day. Dads and nostalgic comics go together like peas and carrots. My dad loves superheroes like Batman and Superman. 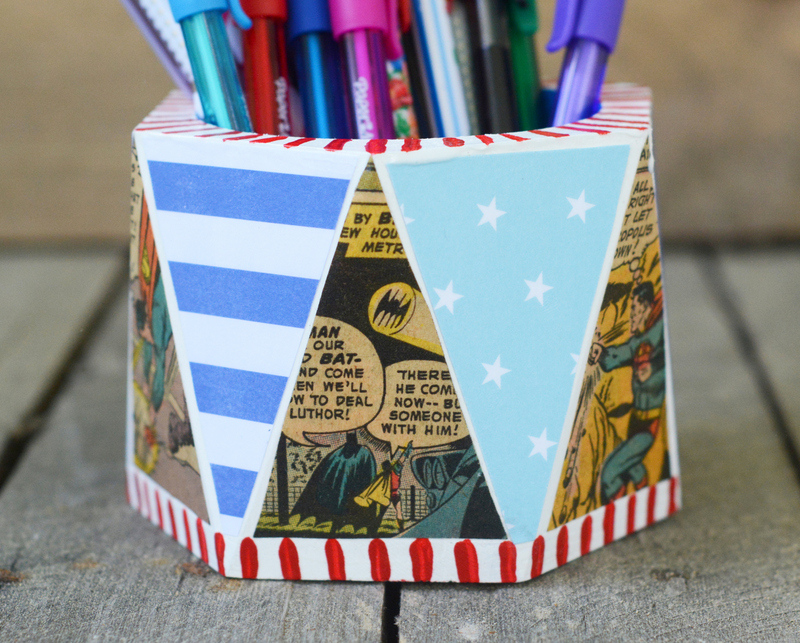 So, I found an old Superman and Batman comic from the 1950's and decided to make him a fun pencil caddy for his desk with comic books. If you don't want to use comic books . 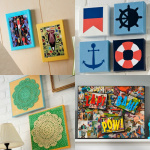 . . grab some color copies of your favorites! 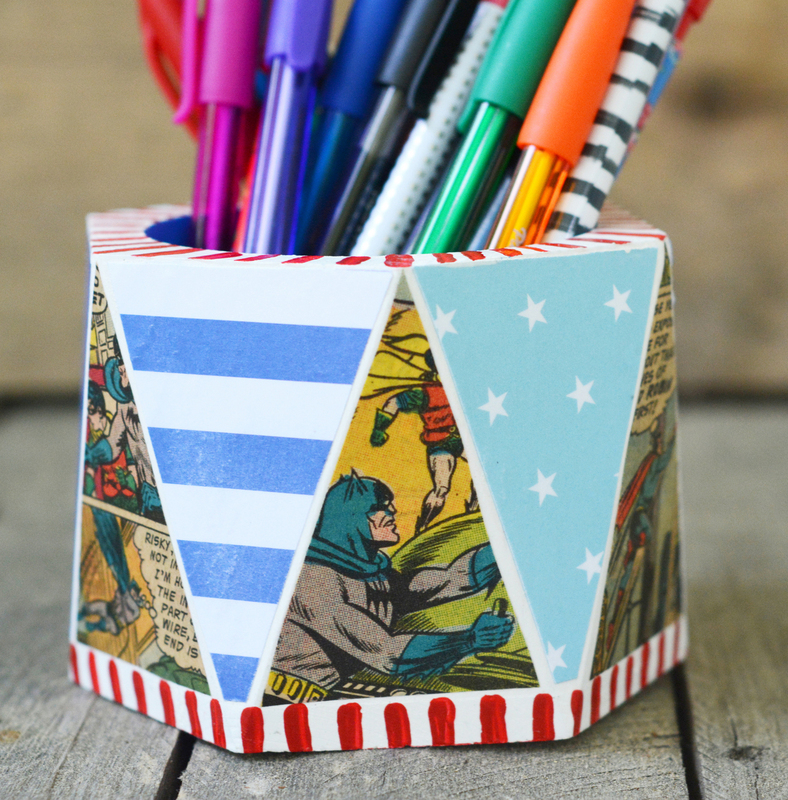 I found this fun wooden vessel at Target in the craft section and thought it would be perfect to make a collage out of some of the comic cells. 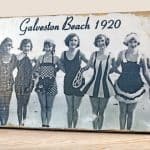 This project is great for kids. 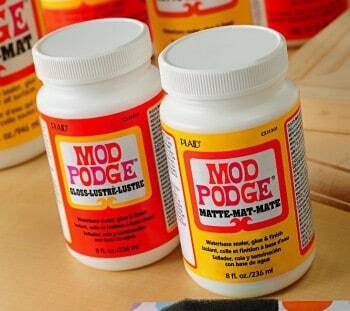 They can help design it themselves, and with Mod Podge Kids Wash Out, you don't have to worry about them making a mess that is hard to clean up or ruining clothing, as it washes out. 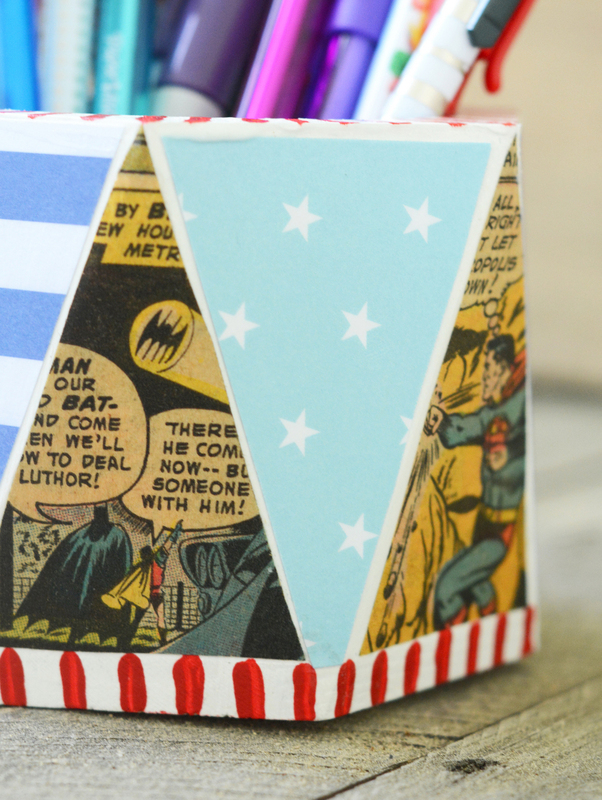 So grab the kids and some comic books and make dad a special handmade gift! The first thing you need to do is paint your wooden vessel if you are going to paint it. Paint to your liking and then let it dry completely. Once your vessel is dry, you need to make your template for your triangles. Lay a piece of paper over the vessel and fold the paper over the raised area of a triangle, then trace the shape and cut out. Use this as the template. 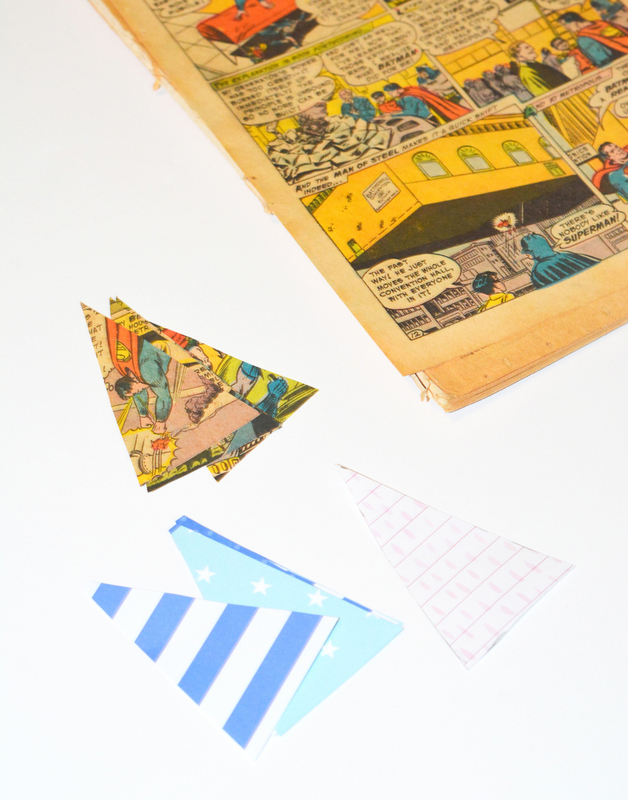 Using the template cut out six of your triangles from your comic book. These will be the ones that are right side up. 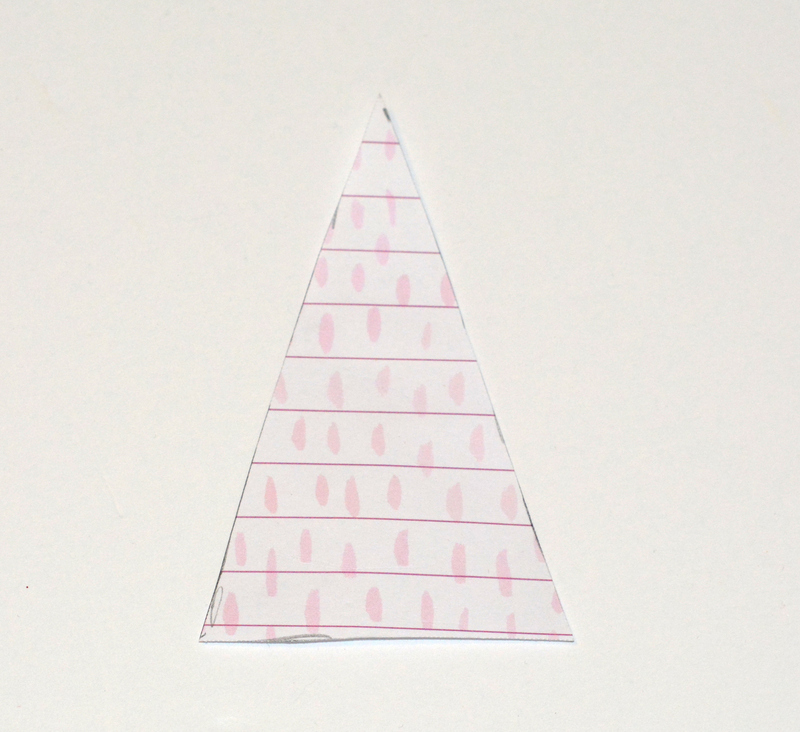 Then cut six of the triangles from your scrapbook paper for the upside down triangle pieces. 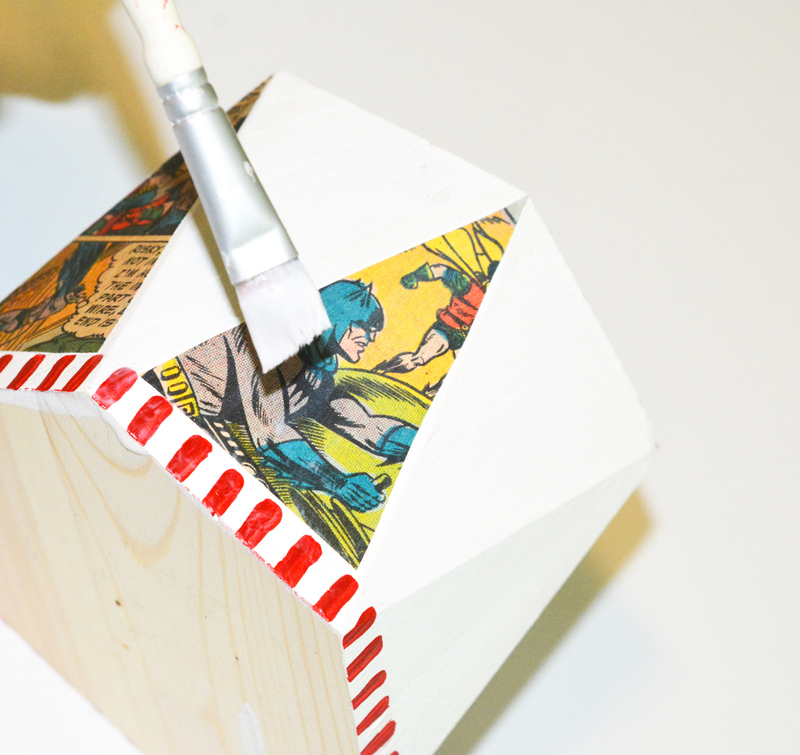 Now you are ready to decoupage your triangles. Start with the ones on the bottom. 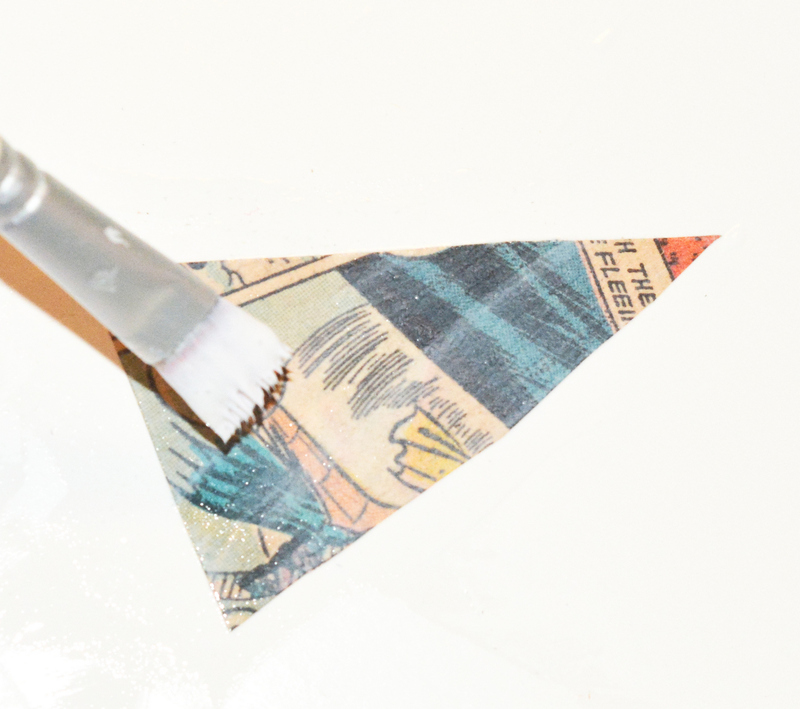 Paint a little medium onto the back side of one of your right side up triangles. Then smooth it down onto one of the bottom triangles on your vessel. Do the same thing with the other comic triangle pieces. Then decoupage on the scrapbook triangles. Let the medium dry. You can smooth out your papers onto the cup with a brayer to get rid of wrinkles and air bubbles if you have any trouble. 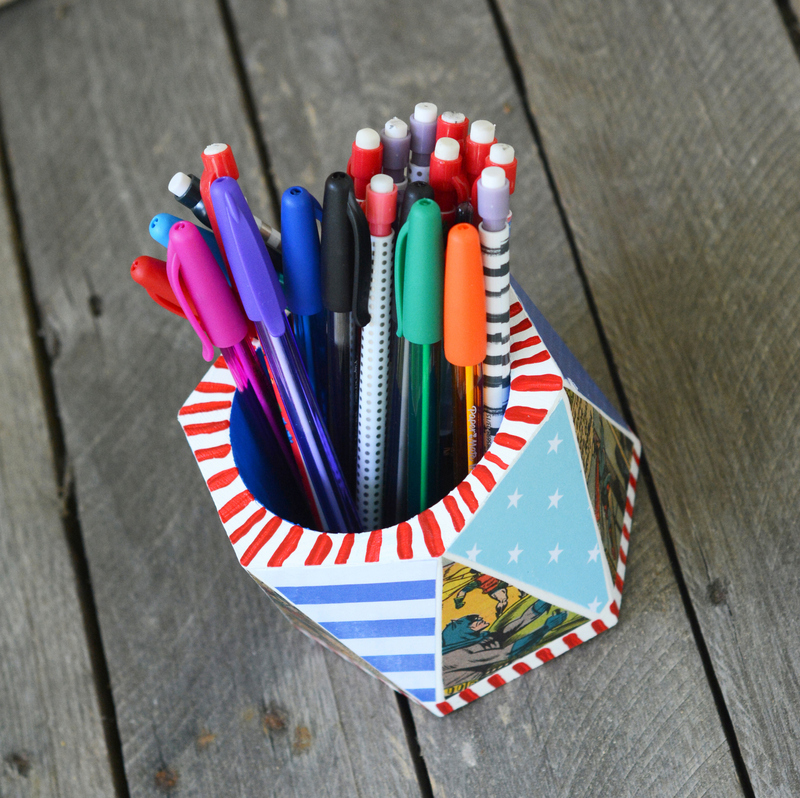 Once you have added all of your paper triangles and the whole vessel is decoupages, you are ready to seal it. 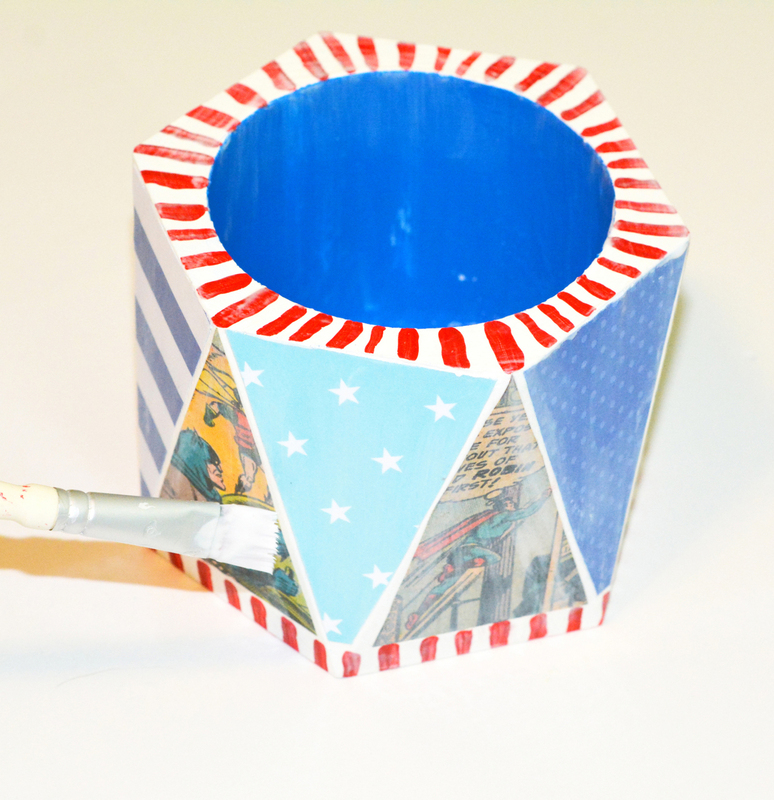 Seal the cup by painting a thin layer of the Mod Podge Kids Wash Out over the top and the inside of the vessel. Set aside to dry, and that's it! 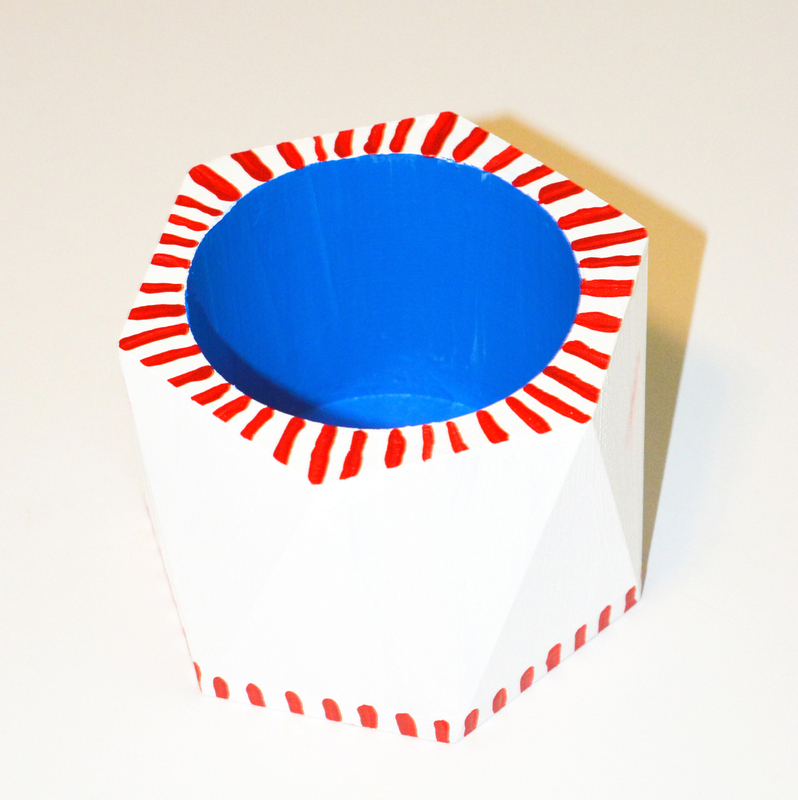 I love how my pencil cup turned out! I think I may need to make some more for the other fellas in our family. I know my dad is going to love this comic books piece, and maybe he will be able to better keep track of his pens and pencils. 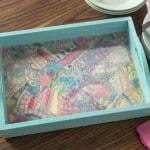 This project was really fast to whip up and very easy to make. If you have little kids, you will need to help them, but older children could easily make this on their own. 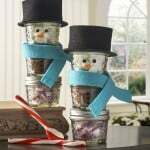 I hope you will add this project to your list of things to make for dad soon!